If you can relate to the above poetry, you have sensitive teeth. Sensitive teeth are no fun. They affect your everyday life. You avoid very hot or cold foods, drink through a straw, breathe through your nose, etc. The team at Overland Park Dentistry understands. We want to help you with your sensitive teeth. Read on to learn more about causes and treatments for sensitive teeth. 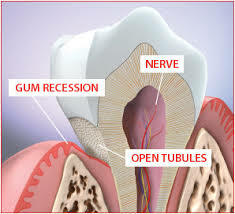 Sensitive teeth are caused by your gums pulling back from the tooth and exposing the the dentin beneath. The dentin is a soft layer of your tooth under the hard enamel. Inside the dentin, thousands of tiny tubes lead to the tooth’s nerve center. When hot, cold, or sour foods touch the dentin, it triggers the nerve in your tooth, causing pain. If you are suffering from tooth sensitivity, come see the team at Overland Park Dentistry. We can help. Call our South office at (913) 647-8700 or our North office at (913) 341-2380. Check out our blog for more great information about teeth, tooth care, and options at Overland Park Dentistry.